Download Hour1 Download Hour2 What would it mean to live 'a higher & more ethereal life' we ask this week in a successor program to last week's show. 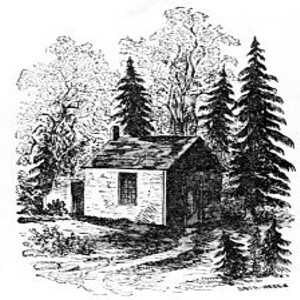 The quote is from Henry David Thoreau's classic Walden which we keep reading, and which details the shed he built by Walden Pond in 1845 at a cost of $28.12½ (i.e. around $1000 nowadays). Our main presentation is a 2013 interview about Direct Action to resist the US government sponsored armed gangs who are attempting to evict people from their homes. We supplement this with short readings from John Taylor Gatto's Underground History of American Education and from Suelo. It appeared to me that for a like reason men remain in their present low and primitive condition; but if they should feel the influence of the spring of springs arousing them, they would of necessity rise to a higher and more ethereal life. What could this 'higher and more ethereal life' be? He commences his musings by noting that the ideas of technological 'progress' are quite commonly double edged (or as Ivan Illich noted, counter-productive):- "the luxury of one class is counterbalanced by the indigence of another... men have become the tools of their tools". Thoreau describes the virtues of a simple life, and why he chose to live a life apart, independent of the expectations of the society around him. After 20 minutes of Walden we hear an interview from Sasha Lilley with Angela MacWhinney on the tactics she has been using in her direct resistance mobilising thousands of people in coordinated efforts to deal with the wave of foreclosures in the North Eastern US. This is essential listening for anyone seeking to help organise resistance against foreclosures. The banks rely on people's ignorance and fear, we hear, and large groups of citizens are having great success by careful planning and a policy of unevicting people as soon as possible. We return to Thoreau's notes of his house expenditure - a total bill of under $30 (under $1000 with modern prices). How come, he asks, are students expected to pay about that much in rent for the right to occupy their similarly modest rooms every year? Is it more about profits for corporations than anything else? Come to that, why does education cost anything anyway? Are students better off learning about life from text books or from actually living it? His intelligent questions reveal the truth of John Taylor Gatto's claim that a section of the US populace were largely aware that the US mass compulsory schooling project was not about benefitting citizens but enriching corporations. We then hear a new section of chapter 10 of Underground History of American Education in which Gatto credits his family for the core of his education. We conclude with a short answer by Suelo to the question "Your ideas sound nice, but naive. Let's get real. Don't you think, with all the thieves, the lazy, the mooches & the greedy, that a moneyless, free economy just wouldn't work?" The money economy, says Suelo is precisely what has trained people to have that nature. This page was last modified on 16 February 2013, at 16:04.